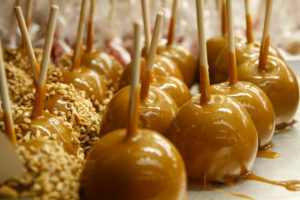 The holidays mean many things to many people, but for you it all comes down to the food, specifically, candied apples. They’re too much at any other time of the year, but the holidays are when you allow yourself to indulge. At least, you used to. Your missing teeth have made it impossible to eat them, and a lot of other foods as well. You’d like to be excited for the holidays, but a key part is missing for you. That can all change thanks to dental implants in Parsippany from the Rauchberg Dental Group. They can give you your smile back and help you enjoy your favorite foods again. Missing teeth can lead to a multitude of problems, and one of the most basic is that they make it harder to eat. This leads many people to avoid essential foods like proteins and fibrous vegetables simply because they can’t chew them. Over time, this lack of nutrition can drastically effect your health and lead to a shorter life expectancy. Missing teeth can also cause tissue and bone loss that can affect how your jaw fits together. One of the most dependable ways to restore them and ensure your future health is with dental implants. Dental implants have an advantage over other methods of replacing missing teeth: They can restore the entire tooth: root and crown. Other procedures only repair the tooth above the gum line, leaving you vulnerable to tissue loss and jaw atrophy. Dental implants involve a new titanium root being surgically placed into your jaw. This not only provides a sturdy base for your new tooth, but can also prevent and even reverse the tissue recession common after tooth loss. It is able to do this because titanium is bio-compatible with the human body, meaning that once the root has been implanted, the body treats it like a natural root and sends nourishing blood to the surrounding area, revitalizing it. Dental implants are one of the most versatile ways you can replace your missing teeth, as they can replace a single tooth, support a bridge, and even anchor a set of dentures. Implant supported dentures actually have a better hold and allow a stronger bite force than traditional dentures. This means you can eat a wide variety of foods and not have to worry about embarrassing slippage. Implants have a 98% success rate and are easy to maintain. All it takes is normal brushing and flossing to keep them looking great for decades. Thankfully, we have a Board Certified periodontist and oral surgeon on staff, which means you can get your entire dental implant procedure done in one place. Many other practices would need to refer you to an outside specialist to place your implants, but we save you the hassle and take care of everything all under one roof. The first part of the procedure involves minor surgery, but this can usually be completed with local anesthesia and requires minimal healing time. The healing period is mostly to allow time for your root to bond to your jaw. Once you have the crown, there will be very little sensation in the implant itself, but it will look and function just like a natural tooth. If you want to be able to eat all of your favorite holiday foods again, make an appointment with us today. If you want to feel good about your smile again, make an appointment today. Dental implants can do so much more than just restore your teeth, so we hope to see you soon.